If a picture tells a thousand words, what are the photo frames they’re encapsulated within worth? What story do they tell? Photo frames are just as important as the images or artworks themselves, as they give the piece context and history. Based on the art print you’re trying to display or the story you’re trying to convey, you can use photo frames to highlight or dramatize certain photos, especially those with more significance or important details. These five ‘trends’ in Photo Frames Adelaide don’t only spruce up your living space. They’ll instantly amplify the ability of your images to speak up — far more than those allocated thousand words. ‘Tray’ photo frames give the final image a distinctly ‘three-dimensional’ look because they’re essentially framing an art print or artwork on canvas. There is a sense of depth and weight, a gravity that tray photo frames give the viewer. Their images simply stand out. It’s all thanks to a clever framing technique that keeps a tight, symmetrical space around the border of the canvas and then frames the photo. The resulting canvas seems to float, as though independent of the frame itself, while still being cozily set in the photo frame’s boundaries. Multi-aperture photo frames may not play up or highlight one single canvas or artwork but it gives you a chance to weave a story around a central theme. In Adelaide, these photo frames are used for corridors, hallways and in stairwells to draw the eye upward as the viewer progresses the length of their walk. Another photo frame ‘trend’ that simply grows every year, shabby-chic or vintage frames feature those decadent and elegant hand carved wood decorations you think about when you think of really old paintings or artworks. While they’re not as ornate, shabby chic frames exude a distinctly ‘vintage’ appeal or aesthetic because they mimic the look of lace. There’s plenty of contrasting details like delicate filigree work, flowers or spherical piping made to look like pearls. For those who love to find and collect classic movie posters, there can be nothing greater than finding the right photo frame to feature their finds in. Rather like individuals who love to collect vinyl records, classic movie posters call of picture frames that are sleek and not too busy. Since many of these movie posters are themselves telling a story, here, the best photo frames will match the colour scheme of the poster without seeking the spotlight. Because a features wall is exactly what it sounds like: it’s a wall space, in your home or office, where you focus the viewer’s attention on one central or key idea or theme. For some, it’s their children. For other, it’s movies from one genre. For others still, it’s the work of one artist, collected over a lifetime. Basically, the sky is the limit. But the how of a features wall is far more interesting. This is a mini-project that can take on a life of its own, so give yourself the right amount of time and discernment to actually fine Art Pints that evoke emotion in you, before even getting started on finding the right photo frames. 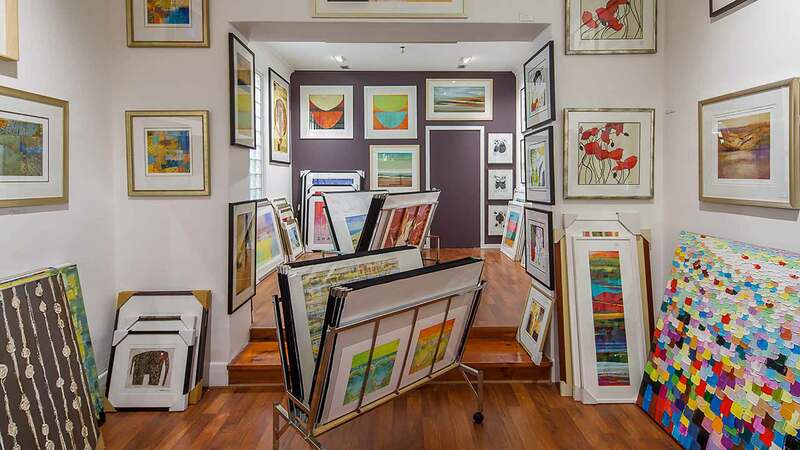 Once you’ve decided on a collection of related and interconnected art prints or photographs, use photo frames of various sizes, orientations, and thickness to assemble a collage of interlocking or tiled frames that move the eye upward. A features wall is a great way to tell a story through photo frames and images. At Art and Frame in Adelaide, we’ve been helping our clients tell stories through art for years. We love these five trends in photo frames because they’re less “trends” than they are tried-and-true classics. It might not work in every home or interior space but pick any of these photo frame ideas when you’re considering how to get your art prints to display aesthetically on your walls.